One of the best things since starting my Pay it Forward campaign has been reading new genres and styles of books that I would never have looked at previously. I’ve read literary fiction, memoirs; short-stories of every genre and some great horror and science-fiction. For my next recommended read – having met the author Heather Hill on twitter and finding her very funny – I got a chance to enter the world of chick-lit. 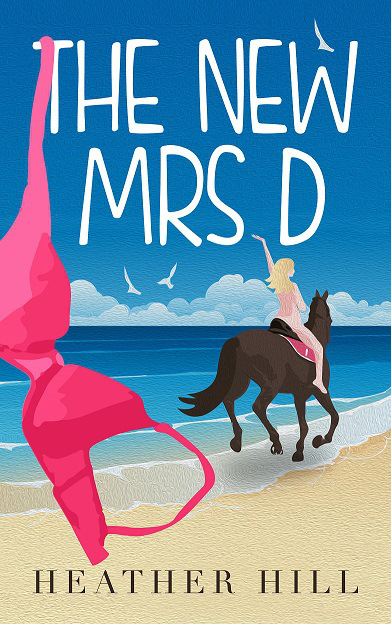 It’s safe to say I’m not the target demographic for The new Mrs D but that didn’t stop me from really enjoying the book. In it we follow the eponymous Mrs D. as she embarks on what she thinks is the start of her honeymoon but soon becomes a voyage of self-discovery. While I may not have been able to relate to the main character directly myself, I know a number of people that share some of her characteristics and it didn’t take long to get sucked into her adventures. While reading I smiled a lot, even laughing out loud on occasion. The book generally has the light touch but Hill isn’t afraid to explore some tougher themes in an open and honest way. For the most part, though, it stays true to its roots – a good, light-hearted comedy. Yes, the plot is heavily signposted at times, there are one or two clichéd characters and the story occasionally strays into the area of cheese, but this is cheese in a good way, like Dirty Dancing or Abba Gold. If you enjoyed Bridget Jones or Shirley Valentine then this is the ideal holiday read for you. Highly recommended. Recommended reads are independently published books that I have bought and enjoyed. They are part of a commitment to ‘pay it forward’ to other independent authors by buying their work and promoting those that I have enjoyed, both here and on Amazon and Goodreads. I don’t accept submissions but instead focus on people who have helped or inspired me through their blogging or who actively support other writers, but I only recommend those books I have personally enjoyed. If you are an independent author I would encourage you to do the same and help pay it forward to the community. For more information please see my blog post here. Thanks, Sue. I have to say it was both an expected pleasure (I had read Heather’s blog and tweets and she is very funny) but also an unexpected one (I really, really hated Bridget Jones’ diaries having read it on a friend’s recommendation). I’m not sure I’m a convert to the genre but I’ll definitely read more from Heather Hill. I enjoy chick-lit, but I didn’t like Bridget Jones either. 🙂 I find this genre varies a lot, and I can relate to some more than others. Hi Heather, that’s wonderful. I see the process as two distinct steps. I tend to choose authors who have been supportive to me or other writers, or who have caught my attention through their blogging or tweeting. My support for the author is then to buy the book. This gives them money for their work and in many cases a much needed sales rank boost. In some cases when I read the book I find it’s not for me, whether through writing style or because the story just doesn’t grab my interest. There have been one or two times where I’ve thought the book poorly written, but not as many as you would think. In these cases, like yourself, I don’t leave a review. Partly because the fault may lie with me, partly because I know how hard it is to write and publish something and don’t want to put people off trying to improve their craft. I know some people would disagree with this and that’s fine. I also don’t have a problem with reviewers leaving bad reviews if they didn’t like something (as long as they are constructive). It’s just not for me. What a wonderful idea! Good for you getting out of your comfort zone. The best way to discover new faves! Thank you! I’ve really enjoyed trying new genres and writing styles. Not all have been to my taste but I don’t regret buying any of them. FREE BOOK! Just sign up to my mailing list and get one of my books of your choice – for FREE! Should you describe your main characters? NaNoWriMo Update 3 – And the winner is …? NaNoWriMo – are you in?